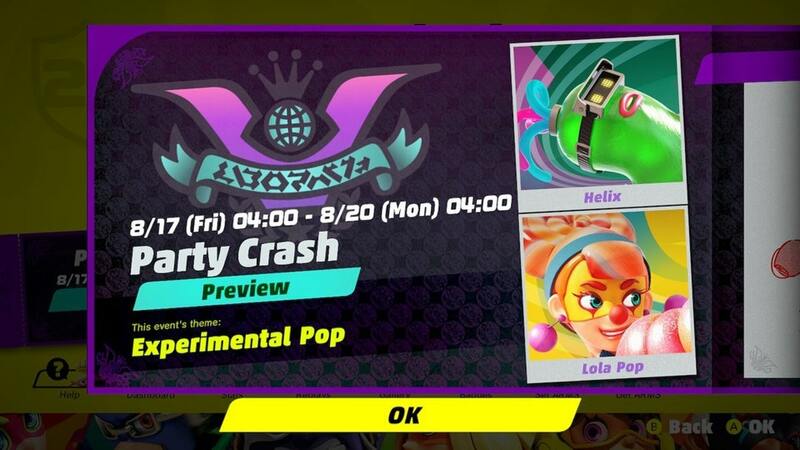 ARMS Party Crash #14, titled “Experimental Pop,” has been announced, with balloonish fighters Helix and Lola Pop going head-to-head. Party Crash is a semi-regular event that takes over ARMS’s Party Match mode for several days and provides fast-paced fights with different rules (Bonus Events) that change on five to 10-minute intervals. Players are also given a “Lab Level” rank, which increases with each match played, with extra points given during Bonus Events or if featured characters (in this case, Helix and Lola Pop) are used. At the end of the Party Crash, badges will be given out based on the Lab Level players have achieved, with a limited edition badge carrying the likeness of the featured character they used most given at level 5, and another variant at level 10. Badges with randomized designs will be given out at levels 15, 20, 25, and 30 — including limited edition badges from previous Party Crashes. The full schedule of Bonus Events can be found by booting up ARMS and selecting the Party Crash banner in the game’s main menu. “Experimental Pop” will take place starting Friday, August 17th at 1 a.m. PST and will last until Monday, August 20th at 1 a.m. PST. Who’s your pick for this round of Party Crash? Let us know in the comments!